With the exception of customer service, there is no better way to earn a customers loyalty than to offer them a reward for it. That is why loyalty programs are vital to any retailer! 54% of respondents would consider increasing the amount of business they do with a company for a loyalty reward, and 46 % said they already have. For those of you who already have a loyalty program, but are having some difficulty in implementing it, here are a few simple ideas to get you started! Nobody wants to share their life story when signing up for a loyalty program. 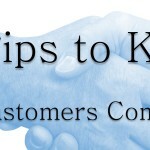 Minimize their discomfort by requiring as little customer information as you can get away with. Generally a name and phone number is all you need, unless they explicitly say that they want to take part in your mail or email marketing. Make sure that your employees are well trained on the loyalty program. Make it part of their initial training to become well versed in the benefits and opportunities provided by the loyalty program, and come up with a script for them to memorize and recite during customer interactions. Nobody can take part if nobody knows about it! Even better, invest your employees! Create an employee contest to see who can enroll the most new customers, offering some sort of prize if they meet their weekly or monthly goal! You may even consider making it a part of their employee evaluations. Everyone loves a giveaway. Offer some sort of gift to anyone who signs up for your loyalty program. A common method is to start new loyalty members off with free points so they are encouraged to come back! Signing people up for your loyalty program is only half the battle: if they don’t earn any points by purchasing from you, the program is worthless. Make loyalty points a focal point of your marketing campaigns. Offer seasonal boosts in reward point earning rates for certain items to encourage sales, or offer one-day-only boosts store-wide. Track and regularly check your sign-up and sales numbers for your loyalty program. If you see participation in your loyalty program lagging, you may want to consider enlisting mystery shoppers. This is an excellent test of your employees and your store in general to see if the loyalty program is being promoted and implemented well, and can help you to identify where your store may be lacking. Got other ideas that have worked for your store? Comment below or on our Facebook page to help other retailers better use their loyalty programs!